This morning I went the National Autonomous University of Mexico (UNAM) in the south of the city. It's the biggest in Latin America with over 300,000 students*. In the early 1950s it moved from scattered buildings in the centre of the city to the far southern suburbs occupying a huge swathe of land which used to be a lava bed. 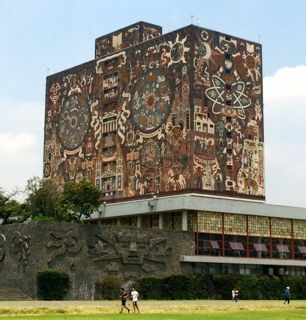 The first buildings to spring up are wonderfully modernist, including the central library which is covered in murals by Juan O'Gorman (who built the house for Diego Rivera & Frida Kahlo - see this post). The campus is now a UNESCO World Heritage Site. Opposite is the Olympic Stadium, built in 1968 and now used by the university. 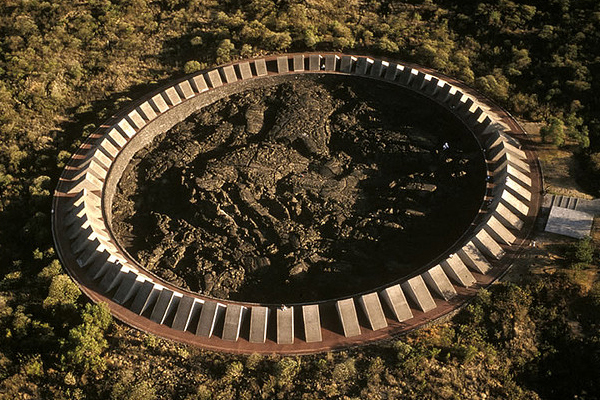 And a mile or so away is a massive, man-made, incredibly austere stone circle, the Espacio Escultorico, which looks like it could host, underneath, the denouement of a 1960s James Bond film. The middle is lava rubble and weeds. Concerts occasionally take place inside it; Jorge Reyes apparently did a few here. It's a belittling place, and a wonder that all that land hasn't been swallowed up. The city of course has spread around and beyond.